Maley and Maley is a Vermont law firm dedicated solely to representing those who have suffered personal injuries. Vermont trial attorneys Christopher J. Maley and John P. Maley have dedicated their professional lives to representing Vermonters who have been harmed by wrongful or negligent conduct. The father-and-son team, both native Vermonters, have many years of experience in personal injury litigation and medical malpractice law. They have earned the respect of their peers, being selected annually for inclusion in The Best Lawyers in America® in the areas of personal injury and medical malpractice. 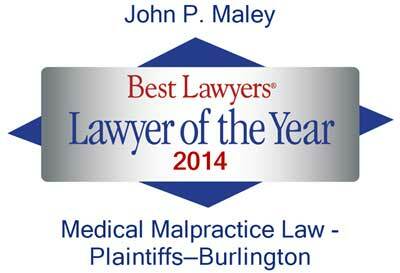 Further distinctions include their recent selections by Best Lawyers® as Burlington "Lawyer of the Year." 2015 "Lawyer of the Year" for Medical Malpractice Law. 2012 "Lawyer of the Year" for Personal Injury Litigation. The Maleys are experienced and successful trial lawyers who have won significant verdicts and obtained fair settlements for their clients. Both attorneys have received Martindale-Hubbell’s AV Preeminent® rating — an attorney peer-reviewed testament to the highest rating in legal ability and ethical standards. Vermont cases they pursue include: personal injury, automobile accidents, medical malpractice, products liability claims and more. John and Chris regularly represent out-of-state residents who have been harmed while in Vermont, traveling, vacationing, attending college, or who have received medical treatment at one of the state’s health care facilities. Maley and Maley also represents Vermont residents for claims arising from injuries or deaths which occur outside the state. Please explore the site and the useful information it provides regarding Vermont personal injury, the experience of the Maleys, recent cases, and the types of matters in which the attorneys provide representation. Maley and Maley provides legal representation for personal injury, medical malpractice and wrongful death cases on a contingency basis. That means there are no legal fees unless the Maleys recover damages on your behalf. If you feel that you or a loved one has been the victim of negligence, malpractice or wrongful conduct, or if you have any questions for Chris or John, please contact them by email or call collect at (802) 489-5258 for a free analysis of your potential case. Jury verdict in favor of estate on factual questions, which triggered coverage in drunk driving wrongful death case. As a result of verdict, insurance company paid its policy limits. Resolved a medical malpractice case involving the alleged failure to appropriately diagnose and treat a 42-year-old woman’s severe lower extremity injury resulting in catastrophic harm for in excess of three and a half million dollars. Obtained a $1,800,000.00 settlement in a wrongful death motor vehicle accident claim.